Tongue scrapers are small pic-looking objects that are used to remove dead cells, food bacteria and help fight bad breath. Here is my pick for best tongue scraper. Tongue scrapers have been used for literally centuries, first having been used by the Chinese and Indians millennia ago. Dr. Tung’s Tongue Cleaner (click to see current price on Amazon) – This is easily my top choice. It’s inexpensive, highly rated and comfortable and very easy to use. Health and Yoga Surgical Grade Cleaner (click to see current price on Amazon) – The biggest difference between this one and the Dr. Tung’s is that this one is a bit thicker and heavier, and is also made of copper (which inhibits bacterial growth). Often times, the most popular product in any niche is not necessarily the best. That doesn’t apply to tongue scrapers! Dr. Tung’s Tongue Cleaner has a staggering 2,061 reviews with an average rating of 4.6 stars (out of 5). A full 77% of consumers have given it a full 5 star review. That’s insane. Deservedly so, because this product simply works. It’s made of stainless steel (which is better against controlling bacteria and lasts longer than plastic), is adjustable, and even comes with a travel pouch. Unlike some other tongue scrapers, the edge is curved and the handles are easy to hold, allowing you to easily, and comfortably, to remove dead bacteria and plague on your tongue in mere seconds. Consumer after consumer raves over how their life has seemingly changed, all from using this simple product. Fresher breath in the morning, as well as reduced plague build-up and improved dental hygiene, all from using Dr. Tung’s Tongue Cleaner. The best part though, is the price. At less than $7 it is highly affordable, and will last you years. Years. This tongue cleaner should at the very least last you at least a year. And that is with daily use. Simply put, you can’t really go wrong with this tongue cleaner. If there was any tongue scraper that could possibly dethrone Dr. Tung’s, it would be this one. It is the only tongue scraper with a higher average rating than Dr. Tung’s, with 511 consumers rating it with 4.8 stars out of 5. What’s even more impressive is that an insane 86% of consumers rated it with a full 5 stars. There are a few differences between this cleaner and Dr. Tung’s. Both are made from surgical grade stainless steel, however the Health & Yoga cleaner is certainly a little bit heavier and thicker. Like Dr. Tung’s, this one is also adjustable using the grips. There are also no plastic handles on this cleaner though for grip, as there are on Dr. Tung’s. Some people may actually prefer this because it’s a lot easier to ensure that 100% of your tongue scraper is clean and free from bacteria. Because it’s a little bit thicker and heavier, sliding it over your tongue is a tad bit easier (whereas with the Dr. Tung you need to apply a little bit more pressure). So really, it all comes down to whether or not you prefer the plastic handle grips on the Dr. Tung’s or the entire device being stainless steel, and a bit thicker and heavier. For me, because they are essentially the exact same price, I felt that I simply liked how the Dr. Tung’s cleaner felt in my hand. The travel bag also was a very nice touch. However, you really can’t go wrong with the the Health & Yoga. 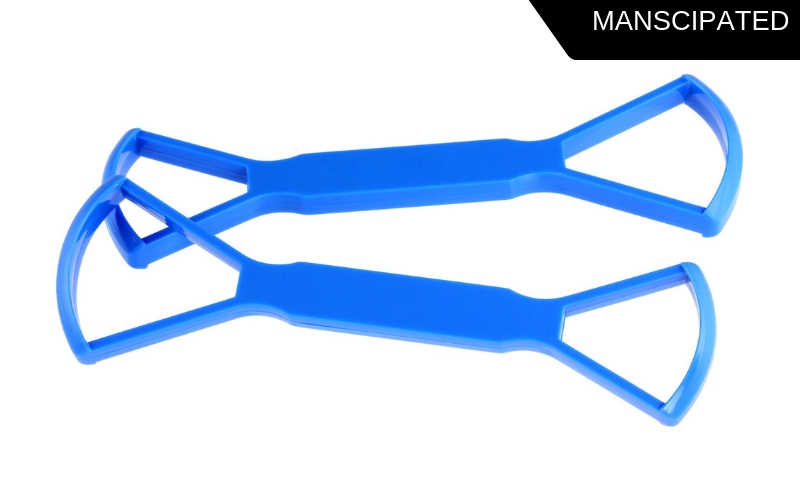 Another popular choice is the Tongue Cleaner made by Pureline. It is similar to Dr. Tung’s and Health & Yoga in that it is highly rated, with an overall rating of 4.6 out of 5 stars, with 79% of consumers giving it 5 stars. As a tongue scraper, it works well. Cleaning off gunk and junk from your tongue is a breeze. It has some key differences however between this and both Dr. Tung’s and Health & Yoga’s tongue cleaner. For starters, this tongue cleaner is entirely synthetic. It’s made of heavier plastic, so it’s not going to break however others (like myself) may prefer the more “sterile” feeling of surgical grade stainless steel. Secondly, it’s not adjustable using the grips as Dr. Tung and the Health & Yoga cleaners are. Perhaps some consumers may actually prefer this, as you could simply get used to it a bit quicker. I simply like having more control over the product. All in all however, it’s a good product, but I wouldn’t recommend it over the Dr. Tung’s or Health and Yoga cleaner. At first glance, the Tongue Sweeper Model P looks like a spoon. In fact, I thought it looked rather cheap and dull the first time I took a look at the packaging. This is a good product, just I don’t think quite as good as the Dr. Tung’s or Health and Yoga cleaner. The Tongue Sweeper has 477 reviews with an average rating of 4.5 out of 5 stars, with 73% of users giving it a complete 5 stars. Impressive. It’s also made in the USA. It’s made entirely of surgical grade stainless steel and feels nice in your hand. The biggest difference between this and the other tongue cleaners is the profile. The Tongue Sweeper is a lot more narrow and slim. It was designed this way so that you could clean back at the end of your tongue without having a gag reflex. I felt that this got back there and could clean a little bit better than the Health & Yoga scraper. 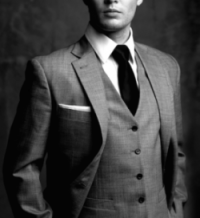 The steel is very smooth, without any rough edges, so that it ensures you get a nice, comfortable clean. For people who may have longer tongues, they may actually prefer this cleaner over the others. I simply liked the grip, as well as the adjustability and the feel of Dr. Tung’s. Believe it or not, tongue scrapers have been around for a long, long time. They were first used by the Indians and Chinese literally centuries ago to aid in the fight against bad breath. The main use of any tongue scraper, past and present, has always been the same; to remove dead bacteria and cells, plague and food particles from your tongue. Doing this ensures not only a healthy, pink tongue but also is extremely helpful in maintaining fresh breath. A lot of people either ignore the health of their tongue (or take it for granted) or give their tongue a quick brush or two at the end of their teeth brushing sessions. Now, if you’ve ever seen a layer of white film on your tongue, it’s most likely dead bacteria, food particles and gunk. That layer of gunky film can very easily spread to your gums and teeth. So essentially, you should be just as concerned about keeping your tongue clean as you are your teeth and gums. You may think that simply washing some mouthwash in your mouth is a good solution to fight against bad breath, but that will never actually remove the gunk and junk that builds up on your tongue. It will only cover it up. Using a tongue scraper is the easiest, cheapest and best option to fight against halitosis (bad breath) and keep your entire mouth clean and free from excess plague, germs and bacteria. There are actually 2 types of tongue cleaners, the scraper and the brush. I didn’t cover the brush type in this article, because quite frankly, they are unnecessary for most people. The difference is very simple. 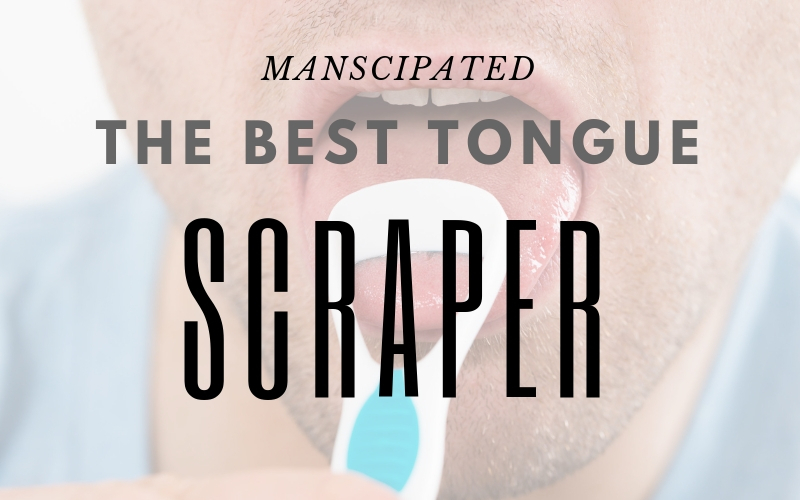 Scrapers “scrape” the gunk and junk off from your tongue, while brushes “brush” the tongue, loosening those dead particles, bacteria and anything else that has been caked on for days, months and years (yuck!). In my opinion, using a simple soft-bristled toothbrush can very easily substitute using a tongue brush. You want to use a soft-bristled toothbrush because the goal is to gently loosen those dead particles and get your tongue ready to be scraped. If you use a hard-bristled toothbrush, you tongue may already be too sensitive by the time you start scraping it, and it may hurt. Using a tongue scraper is quite easy and straightforward. Next, scrape your mouth using your tongue scraper. You want to start all the way at the back of your tongue and scrape towards the front. The key here is to be gentle! Especially the first time. Some people have very sensitive tongues and their tongue may feel “raw” if they brush and scrape for too long. Be gentle! Gentle! Gentle! Don’t get all gung-ho and use too much pressure, or your tongue will get a little raw! Rinse off your tongue scraper before you use, while you use it, and after you use it. You should rinse your tongue scraper off before you use it, as dust particles and anything in the air may have settled on it from your last use. You don’t want that stuff in your mouth. Likewise, you will want to continually rinse it during your scraping sessions as well, to rinse off gunk that has accumulated. Clean as much of your tongue as possible. This is a no-brainer, but it bears keeping in mind. The cleaner your tongue, the cleaner your teeth and gums are going to be. If there are areas of your tongue, such as the sides and the back, that are not clean, it can still spread bacteria around your mouth. Don’t just focus on the top part of the clean, but really try to clean and scrape as much as you can. Using a tongue scraper is one of the cheapest and easiest ways to immediately improve your hygiene. There is literally no drawback to using one, as tongue scrapers are extremely inexpensive, and they only take a few minutes to use each day. Grab one, and your dental hygiene, as well as your breath, will improve from day 1!